This past Sunday night I received 3 newborn squirrels who were just taken from their mother unnecessarily because a woman didn't want them in her yard while she having construction done. These babies were only 13-14 grams. They were well hydrated and in excellent shape. I fed them 6 times over night during a 12 hour period of time and they were doing beautifully - eating, peeing, pooping. I keep one heating pad upstairs in my house for them for at night and one downstairs for the daytime. In the morning I brought them downstairs and put their sterilite container on the heating pad on low. I fed them and all was great. An hour later I checked on them and one was dead. I picked him up and he was like a hot potato. I frantically found the other two, she was lethargic, turning purple and overheated. I tried everything to save her but she died 4 hours later. The heating pad had a major malfunction and was too hot to even hold. My poor babies died because of it. I had checked the pad before and after I fed them and it was fine but it must have short circuited in that hours time. Some how one little boy survived. He has been slow to gain weight but is finally doing well now. I've named him Hercules. This has been the most difficult thread for me write but I needed to share my experiences with all of you. Accidents happen to all of us and sometimes lives are lost but hopefully my story will help spare even one life. I've been rehabbing squirrels for the last 4 years and have successfully raised and released over 125 squirrels. I've experienced a lot but nothing has or will ever scar me like this. I am completely devastated. PLEASE WATCH YOUR HEATING PADS CLOSELY. CHECK FOR OVERHEATING AND HOT SPOTS. IR - Please move or edit this if you need to. Thanks for the other day. I really needed it. Jean, I know how hard it was for you to write this. But if one little life is saved because of your tragedy, maybe it will lessen the pain. And I will bet that many little lives will be safer, because we will be more diligent in checking our equipment and our babies. Bless you for sharing this. I may put a copy of this as a sticky in one or two more other places. Thank you for that warning!!! I've sometime wondered if those things can be trusted. I keep the pad under only half the container so that they call crawl to a cooler spot if they are able. Sorry this upset you. Don't blame yourself. Once, I thought I had safely secured the door to the room I was keeping some babies in but my wily dog manage to turn the knob while I was out and get in and crush the skull of one of them. The other was unharmed. We do our best but we aren't infallible. Sorry for bumping an old thread, but I do snakes and a lot of them are in tubs. Heating is done with FlexWatt heat tape and controlled with Herpstat thermostats. There are cheap thermostats in your local Petsmart/Petco, but these are a waste of $30. Good, reliable heating solutions will always include a quality thermostat. With our prarie dogs and baby possum we used aquariums till they were up and running and able to climb. We put Zoo Med ReptiTherm heat pads under them either the RH7 or the RH4 depending on what you are using as a substrate and how thick and if on a rack or something solid. Our possum has an RH7 with aprox 1/2" of corn cob and a washcloth under her hut, on an open rack. It stays lukewarm to the touch and runs 24/7 the same temp and designed for continuos use. She loves it. The aquariums are easy to clean and seem to prevent the "Something huge just reached in to get me!!' fright, they see us approach them. Just a "what works for me" note. I've been using a hermit crab heating pad. It's small and stays at a certain temperature. Since it is so small, it's easy for them to scoot off of area if they get warm. We've used it for birds and rodents, works like a charm and doesn't take up much storage space when not in use. What is the ideal temperature for the inside of the nest box? Is there a suggested range? I don't want to overheat, nor underheat this tiny pinkie. Put the heating pad on low and make sure it's on the outside of the container only under half. can crawl to the top. For one this size I would suggest 90-95 degrees. I read your other post and he is 12 grams, correct? I keep my pinkies at a steady 85-88 degrees and humid. Seems to work well for them. One thing I've found which works much better than a heating pad for baby squees is a seed-starting mat with thermostat. It is waterproof so you can wipe it down with soap and water if the babies make a mess, and if you are clever enough you can probably even use it outside in a RC since most are made to be set up in outdoor greenhouses. A germination mat is also VERY thin-- you can slide it under a shelf inside an enclosure with the cord trailing out so they can't chew on it if they aren't in a container. They also tend to have a much more even distribution of the heating elements, which are thin and usually go edge to edge. Seed mats also is designed not to turn off, since the point is to maintain a temperature for seed germination. This is important since these days, most commercial heating pads auto-shut off for safety reasons. 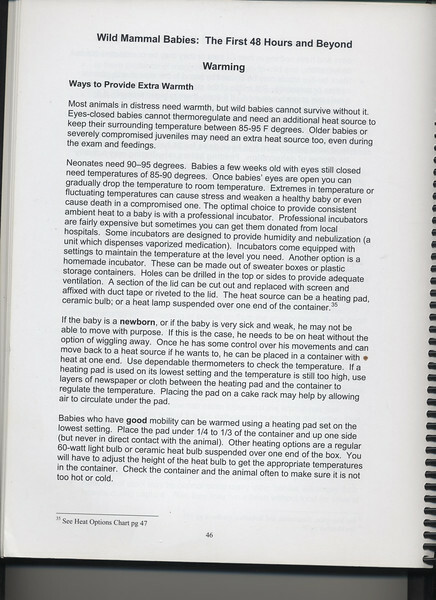 The thermostat is also great-- you can easily adjust up or down, depending on how warm your babies need to be kept and it will tell you the temp it is holding at. It is also not manufactured with the mat but plugs in and can be swapped out if you need to get a new mat, you can use the same thermostat. They also tend to be reasonably inexpensive, all things considered. Just thought I'd mention this since I hadn't seen it mentioned anywhere else, and it gives me MUCH more peace of mind to know I have this many safety and stopgap measures in place to make sure the babies stay warm and safe!